Another hellacious week I'm afraid, coupled with the mild burnout I felt after cranking through all the black on the infantry from last weekend meant I didn't get a whole lot of brush time in. I didn't want to lose my forward momentum entirely however and managed to finish off the trio of Rhinos when I could squeeze in a little time. The first two will act as transports for the Tac squad when it's not being run as a big 20-man blob. Once I got some weathering and decorations on them the yellow looks a little less slapdash, but overall the sepia wash stage from the scheme doesn't work particularly well over such large flat surfaces. Overall though they ended up being perfectly serviceable! The veteran squad will be rolling in the third Rhino, and again there are some things about the scheme that I'm not happy with - The edge highlighting, never my strong suit, ended up being pretty disappointing. Scaling up the colors from the black scheme I'd used on the infantry sounds good on paper, but on larger surfaces such as vehicles, the scheme ends up much brighter and stark than I had hoped. I think in the future I'll be leaving the final grey highlight off, and instead wash the dark grey edges down with a black wash then re-highlight with the dark grey again. Should keep it a bit more subdued. 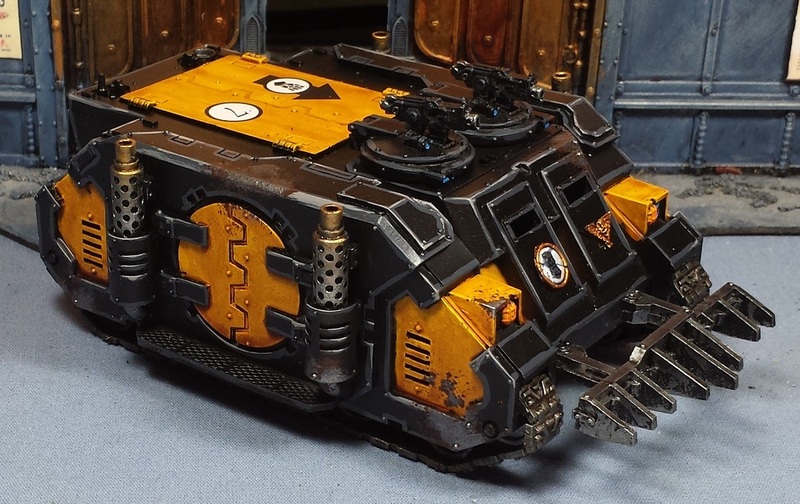 I do like the predominantly black with yellow accent panels look overall though - the upcoming Land Raiders and Venators will be sporting that look, I think! Rather busy Saturday ahead, but I'm hoping to crack on with the infantry from earlier and get some good progress towards completing them on Sunday! For all you're being tough on yourself these look great mate, the alternate scheme is a real winner fr me too, and will really set the vets apart. We've just had Salute 2015 here (it's Saturday night). My mind is boggled and my feet ache. Three great looking Rhinos in a slow week? You are a painting machine. Are the symbols decals, the ones on the roof hatches stand out really well. These are great! That yellow is bangin'! I dunno mate, I think these look just fine as they are. Just looking at them it strikes me how much better your paint jobs have gotten since I started following your blog. @Jason Meyers: Thanks man! I have a hard time with yellow too, this project has definitely been a challenge! @Zab: Indeed - this is definitely a scheme where an airbrush would be a great help. One of these days I'll have to make the plunge. @Nemesor89: Thanks - I totally agree! @Zzzzzz: Niiiiice! Looking forward to seeing some pics from the event! @Smithy2727: Hah! Too be fair, the main hull colors were already in place, just had to do some detailing. 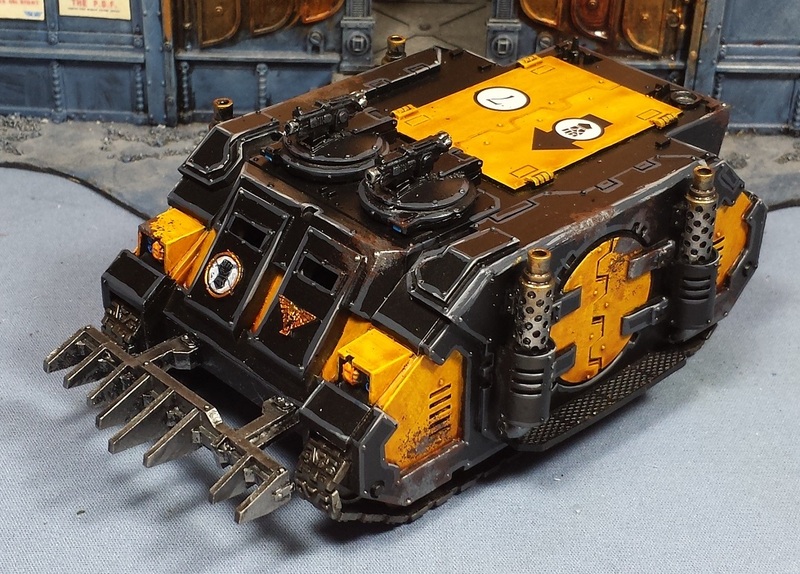 The decals on the roof hatches are from the FW Imperial Fists transfer set, there's some cool ones on there! @Dai: I appreciate it! Always trying to get a little better each time! As much a fan of the base Imperial Fist yellow as I am, I love the contrasty dark veteran Rhino, and don't think the grey hurts it at all. Well done! I like the alternate scheme too. Really breaks up the monotony of a single colour force. If it was on each vehicle it would lose it's value but on 'venerable' items every so often it's a nice change. @Greg Hess: Sweet! Definitely looking forward to 'em! @TheAmbit: Cheers - I appreciate it!